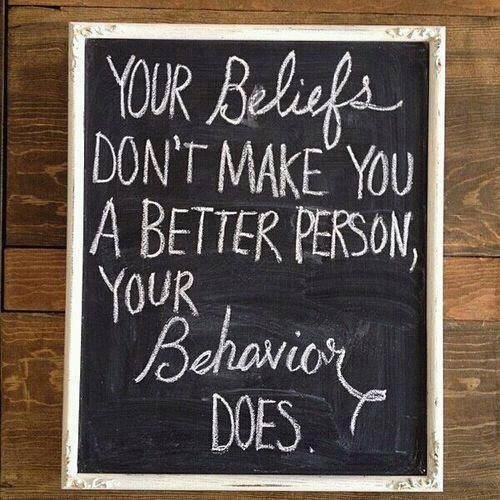 Do beliefs affect people’s behaviors. This means that believing that someone is ignorant or inept in a certain area will result in changing your behavior in such a way that you will only focus on his mistakes and ignore what he’s actually able to accomplish with success. How beliefs affect behavior? Here are just a few scenarios.. Limiting beliefs limits people’s potential: Limiting beliefs affects behavior by preventing people from taking certain actions that they would have otherwise took if the belief was not there. An intelligent child might never study and so fails the exams if he believes that he is not intelligent. Beliefs and information filtering: Just as I said before we filter information based on our beliefs and only absorb the information that matches our belief system. This impacts our behavior by making us biased towards what we believe no matter how much proof is provided. That’s why persuading someone to believe in something against whatever his beliefs are is hard. Beliefs shape reality: If a guy thinks that he will never find a job (a belief) then he will not become motivated to prepare himself for the job market (change in behavior) and later on when he tries to find a job he will fail (so his belief will become true). Good reasoning doesn’t come naturally. In fact, people are instinctively terrible reasoners — most of the time, the way our brains work isn’t rational at all. Even if you might have exceptional reasoning skills, we still have to overcome instincts to do as we think is right in your own eyes. That’s how beliefs can shape reality.. Previous Is Alaska Stuck On Stupid? Or Is it Just the Democrats Wishful Thinking? Next How Big is Alaska? — this book is about the history of ideas, ethics, sociology and popular culture. My family learned later in life about “self limiting beliefs” Lucky for us, our young daughter was still forming her beliefs and is now much more successful than she could have been had she let her lack of confidence take charge. Instead she is becoming more confident. I also struggled with beliefs that were instilled in me as a young child, then again as a young wife. However, I agree very much that we “become what we believe” and we are taught what to believe as young children, until we are able to move forward and develop ourselves as individuals. Very good information! Oh thank you for your comment, Sunnyinak! It means a lot that you stopped by and shared your thoughts..
Heavens, I read your headline as “Briefs and Behavior,” so I thought I was going to see something about New York’s Anthony Weiner. What a relief to see that it’s not. Lol! You’re funny! This is a selfie of another kind! I think psychologists call this self-fulfilling prophesy. It can be extremely limiting if one doesn’t recognize it.